Well, it's done. I successfully defended my thesis, and it has been filed with ProSource. It did not include all of the work I wanted to put in there, but as my advisor says: "Theses and dissertations are never finished-- they are abandoned." At least my committee found it to be adequate. You can find it here: Constraining the Small Binary Asteroid Population of the Main Belt Using Doublet Craters on Ceres. A doublet crater is a pair of impact craters in proximity to one another that are created by the same primary impact event. 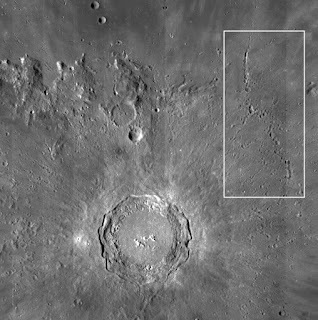 Doublet craters have been observed on Earth, on the Moon, on Mercury, on Venus, and on Mars. Doublet crater formation. 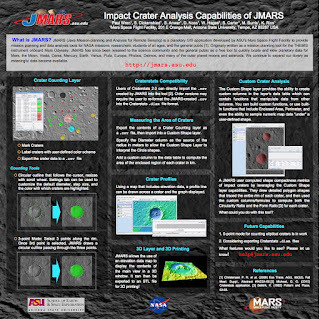 Early research attributed doublet crater formation to a single impactor broken up by either atmospheric disruption or tidal forces, but further analysis revealed that these processes could not result in sufficient separation of the components to create observed doublets. It is now believed that well-separated binary asteroids are the true source of doublet craters. The percentage of impact craters in the inner solar system that are doublets would require ~15% of planet-crossing asteroids to be binaries. This makes doublets an excellent source of evidence for the prevalence of binary asteroidal systems, and can constrain the possible nature and formation processes for such binaries.